Harry Simeon (1896 to 1936) one of Royal Doulton’s most versatile potters. Harry Simeon, was one of Doultons most versatile and talented artists and many Doulton collectors are impressed by the diversity of his designs. As a young man Harry Simeon worked with his father as a monumental mason. He studied modeling and sculpture at the Huddersfield School of Art where he won a scholarship to the Royal College of Art in London. After his studies were complete, Harry joined Doultons Lambeth studio in 1896. Harry Simeon’s earliest work includes vases with foliate decoration in the fashionable art nouveau style. Harry’s bold linear designs were ideally suited to the raised tube-lining and pigment brush line methods used at Doulton in the early 1900s. Simeon also used his sculptural skills to advantage, modeling a number of animal models and trinket trays which were slip cast in small editions in the late 1920s and 30s. 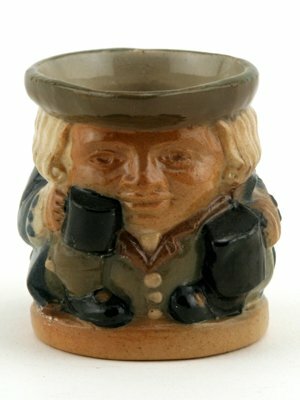 The stoneware toby jugs made at the Lambeth factory were also modeled by Harry Simeon. He designed an extensive series of tobies, tobacco jars, ash pots, ink wells and candlesticks. 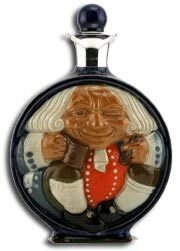 Keen toby jug collectors seek out all the different color and modeling variations that exist in this popular series. Harry Simeon also worked with William Rowe on the Singapore Railway Station tile panels. They also worked on the Persian Wares, which were a new line introduced by Doulton Lambeth in the 1920’s. Persian wares were adapted from early Isnik pottery designs and are probably some of Doultons best art wares. Manufactured in relatively small numbers due to the time consuming work involved, Harry Simeon Persian wares are rare and can be expensive. Harry Simeon also designed some of the Medieval English pottery introduced by Doulton’s art director Joseph Mott around 1910. Harry Simeon Gallery … A few years ago the Victoria and Albert Museum in London were delighted to receive a collection of Harry Simeons work from his daughters. So Harry Simeon is well represented at this world famous museum.